Yikes. Just noticed the flower invader. Looks like it is pissed you blew its hiding spot. Haha I wouldn't doubt it. I picked one up once as a kid and it bit me. Can't stand those things. What it is tell you is, not to pick it up. Put the back of your hand out and if it decides to get on your hand, it will. I used to have one that joined me on the front porch rocking chair in the evenings while I had a beer or two. They used to be a common sight in my annuals and perennials in late summer but I don't think that I saw even one this past summer. They will often walk on to your hand if you are still. I haven't seen any for a while either. I think neighbors using chemicals in the yard aren't helping. I've stopped using chemicals in my yard and on my roses. It's better for my health and my yard. Pretty yellow rose. 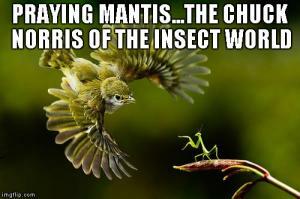 I don't see mantis as often as I used to. where did you take that picture and with what type of camera? It's a beautiful picture! This is the one most people are in. I think it is an open group and you just have to hit join. Thanks Ender for doing my work! Just show up … the Group is open to all. Tomorrow I'll post the Creative Arts Group regular feature … Creative Arts Thursday/Friday … post whatever creative work you care to … as many items as you like. Members will give feedback if you'd like, or, simply enjoy what you post. Glad to see another photographer here on NT! Keep sharing your photos, Don. Love it ! I have a similar pic with a katydid.